It is extremely important to have a clear understanding of your legal rights after an accident, especially if you or a loved one has been seriously injured. By hiring the Bainbridge Island accident attorneys at Davis Law Group, you can rest easy knowing that your legal rights are protected. Our award-winning personal injury attorneys fight to get victims the compensation they deserve, and have handled some of the most complex cases in Washington state. If you or a loved one has been seriously injured in a car accident on Bainbridge Island or elsewhere in Kitsap County, contact Davis Law Group at 206-727-4000 for a case review or to schedule a free legal consultation. If you or a loved one who lives on the island has been injured in a Bainbridge Island accident, it is very important to hire the right attorney for your case. Although it can be challenging, finding the most qualified attorney to handle your case can make all the difference in the outcome of your auto accident or personal injury case. We will negotiate with the insurance company and reach a fair and just settlement while you recover from your injuries. To learn more about what we can do for you, contact us at (206) 727-4000, use the chat feature below or fill out the form on this page. We look forward to meeting you and to reviewing your claim and your legal rights with you. The island’s charm and natural beauty makes it a desired tourist destination and an ideal family community for those looking to escape busy Seattle. Whether you’re visiting the famous Bloedel Reserve or the island’s fantastic views of the Cascade Mountains, Bainbridge Island has something for everyone. In 2005, Money magazine named Bainbridge Island the second-best place to live in the United States. Today, Bainbridge Island has a population of around 23,000 people, making it the second largest city in Kitsap County. 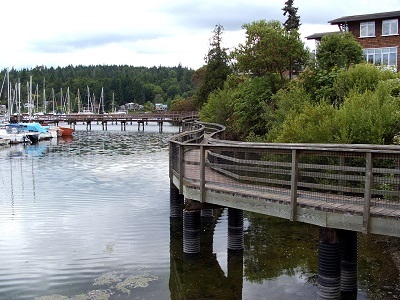 Accessible by ferry from Seattle, Bainbridge Island is a 65 square mile island located within the Puget Sound Basin. While Bainbridge Island is a small family community, the reality is that accidents do happen. Though the island is far less busy than other Seattle metro areas, negligent drivers and others that cause accidents may come into your life. Whether that’s a texting and driving accident on Highway 305, a dog bite incident in Fay Bainbridge Park, or a motorcycle accident in Battle Point, accidents do not discriminate and injured victims must protect their legal rights. Bainbridge Island's reputation as one of the best places to live in the United States is explained by its majestic views of the Cascade and Olympic Mountains, as well as Mt. Rainier. But even one of the most beautiful towns in Washington state is not immune from the fact that human error can cause accidents, and accident victims need legal help.